A few weeks ago, Andy Reid named Nick Foles the new Philadelphia Eagles' starting quarterback, replacing Michael Vick, the $100 million quarterback. Due to Foles breaking his hand this past Sunday, Vick will be starting again in the Eagles' final game against the New York Giants. "I'm not going out to audition for a job. 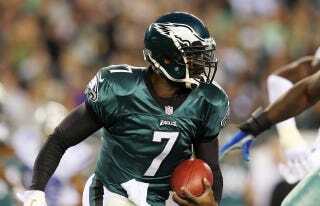 I'm going out to try and win," Vick told USA TODAY Sports on Monday. "My play and what I've done for this league and the accolades that I have speak for themselves. The thing I want to do is improve. Whatever happens next year happens. I'm just going to be a guy who, wherever I'm at, I'm going to make the team better." Although Vick doesn't look at this game like an audition, it really is. The Eagles will most likely cut him before Feb. 3 in order to avoid paying him $16 million, so this final game is his opportunity to build up any value before he becomes a free agent. There are a few teams who will look for suitable starters next season—the Chiefs, Cardinals and Bills immediately come to mind—and one of them will give Vick a chance, but combined with the opportunity to knock the Giants out of the playoffs, his performance puts more stake into an otherwise meaningless Week 17 game for Philly.